In addition to one of the most beautiful playscreens in the arcade world, Joust boasts one of the most ardent groups of followers I have seen. One reason for the success of Joust is that with two players, both are engaged in the game simultaneously. This leads to a feeling of comradeship between players as they use skill and teamwork to overcome their adversaries. As you fly your bird around the screen, you must keep in mind that the object of Joust is to unseat enemy riders and retrieve the eggs that fall as a result of a collision. To successfully knock a knight off of his mount, the lance that you wield must be higher up than his when your two birds make contact. Basically, that's the entire game. When two people play, they are confronted with more sophisticated and intriguing waves of enemies and they must make additional strategy decisions. Most important, they must decide whether to compete or cooperate. 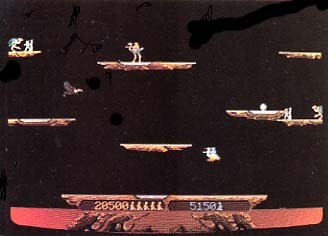 The playfield consists of two wooden islands suspended in midair near the center of the screen, a large ledge at the bottom, and two other ledges that wrap around. For the most part, the players remain airborne, trying to unseat enemy riders while avoiding collisions with the ledges. If a player runs into a ledge, he bounces off unharmed. You have a two-directional (left and right) joystick that controls the direction in which your mount moves. By repeatedly tapping the flap button on the control panel, you lift your bird off the ground and up into the air. If you stop pressing the flap button, you gracefully lose altitude and ultimately land. 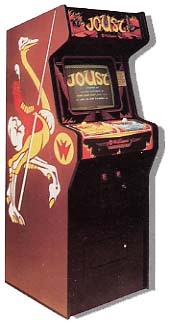 The first player in Joust is portrayed as a yellow knight mounted upon an ostrich. The second player is blue and rides a stork. Slung in your arm is a lance with which you unseat other riders. The enemy rides upon green-winged buzzards. The color of the enemy riders indicates their level of skill. You encounter only red knights, Bounders, at the start of the first wave, but more aggressive enemies gradually enter the fight. Grey riders, Hunters, are quicker than the red, but steel-blue knights, the Shadow Lords, are more powerful than the other two combined. When a player unseats an enemy rider, a green egg falls from the point of collision. The eggs in Joust are quite resilient--instead of breaking, an egg bounces when it hits a ledge. If an egg remains untouched for a few seconds after it lands, it hatches and a more dangerous adversary emerges. When one of these standing knights appears, a buzzard flies onscreen and attempts to pick him up. Like Evil Otto in Berzerk, this riderless-creature appears if you are taking too much time to complete a wave. It swoops horizontally across the screen and announces each pass with a horrible shriek. Coming into contact with a pterodactyl is deadly. Once you have unseated all of the enemy riders and cleaned up the eggs, the pterodactyl flies offscreen. Any wooden slab upon which you can land is called a ledge. The position of the ledges is the same in every game. Certain ledges dissolve at the beginning of predesignated waves. Portals are grey slices imbedded in the wooden ledges. They mark the positions from which new riders enter the playfield. If a bird is hovering close to or above a portal, no new riders may enter the combat through that portal. At the beginning of a game, there are four portals located at various positions among the ledges. As ledges dissolve, the portals diminish in number. Found extending across the length of the screen on the bottom ledge, the wooden bridge is slowly consumed by the rising fire beneath it. You can land on the bridge as long as you are careful not to walk over the edge into the lava. The lowermost ledge on the screen is surrounded by a lava lake. Anything that falls into this lake of boiling red liquid is destroyed immediately. The lava that destroys the bridge is home to a menacing troll. The little whisps of flame that flicker on the surface of the lake indicate the presence of the troll. Should a rider swoop down too low, the lava troll will thrust his hand upward and grasp at the bird. During advanced levels of play, the player cannot flap hard enough to break the troll's grip and a slow death ensues as the troll drowns both bird and player. For longer games, always play Joust with another person. Players should be relatively equal in skill so that the individual scores do not become too unbalanced. When engaged in dual play, it is essential that both players cooperate. If you fight against each other, your game will inevitably be shorter. Play as a team and enjoy the thrill of beating the computer-driven opponents. One drawback to playing with another person is that although you may live longer, the total number of points is divided between players. This means that your score on any given wave will be lower when you are playing with a partner than if you were playing alone. Keep in mind, however, that the total amount of time you spend per game is extended by playing as a team. It is important when playing together to keep track of each player's position at all times. Remember, the player's knights are yellow and blue, anything else is an enemy rider and should be eliminated. It may sound stupid, but players often find that they lose track of their own mounts. With the multitude of other birds, the numerous collisions, and the wraparound feature, it is surprisingly easy to get confused. The designers at Williams sure know how to create conflict in a game: offer points to the first player who kills the other. This is the object of the Gladiator Waves. Although there is a prize of 3000 points, neither player should go for this, because in the long run both players will be disadvantaged by the loss of a mount. The most important thing to remember is to avoid conflict between players. Divide the screen up either horizontally or vertically and remain in your part of the screen. Inform your partner of your intentions with remarks such as "Stay there, I'll get this guy when he comes up. When you defeat an opponent, it turns into an egg. To earn extra points, try to catch each egg before it hits a platform or falls into the lake of lava. If a green 500 appears above the regular score when you catch an egg, you have been awarded the bonus points. When you decide to go after a falling egg, make sure your partner knows what you are doing. Greed often gets the best of players when they fall to communicate effectively. There are two strategies which can be employed to avoid such player conflict. The first requires that the player who unseats the enemy rider is entitled to the resulting egg. In the second, players stake territorial claims on different ledges. Use whichever method works best for your style of play. If it is safe to do so, try to pick up an egg right after it lands. When an egg hatches, a tiny knight appears; and waits silently for a new mount. It is safe to swoop in and grab this knight as long as he is not about to climb aboard a fresh buzzard. Team Waves occur only when two people are playing Joust. If one player unseats the other during a Team Wave, it is registered as a conflict and no points are awarded. Each player receives a generous 3000-point bonus if both survive a Team Wave without any conflicts. Beware of the very top of the screen because there is no visible border to help you accurately gauge the amount of headroom you have. Since the enemy birds are controlled by the computer, they can slide perfectly along the topmost edge. This gives them the advantage of optimum positioning. Be on the lookout for areas from which enemy birds can unexpectedly bounce down upon you. Due to the ability of elements to wrap around, one of the most dangerous places to be is along the right or left side of the screen. It is also dangerous to try to hover below a ledge, because often you will hit the section above you and bounce down into the path of an enemy bird. Remember, each time you collide, you bounce around and lose your orientation. Each person who plays a Survival Wave without losing a mount is awarded an additional 3000 points. This is a very nice bonus, so be extremely careful during these waves. When you hover between two ledges that are on the same level, you prevent the birds that are below you from going up to a higher level, but you leave yourself open to attack from the birds overhead. If there is nothing above you, then these midway positions are safe. The nice thing about being between levels is that you can drop down onto the enemy birds as they pass beneath your wings by simply removing your hand from the flap button. Remember, eggs bounce when they hit ledges, they do not break. Knowing this will allow you to glide in and catch an egg on the rebound rather than landing to pick it up. Avoid coming to a complete halt if you ever have to land on a ledge. Since the game elements in Joust are governed by the laws of normal physics, you must build up momentum before you can become airborne again. This takes precious time. Every fifth wave is called an Egg Wave. That means that instead of riders materializing through the portals, the wave begins with eggs scattered about the ledges. All at once, a flock of buzzards flies onscreen, and the eggs start to hatch. To prepare for an Egg Wave, each player should be positioned at the end of a long platform at the close of the proceeding wave. Preferably one player should be on the topmost ledge, and the other on the middle ledge. This set-up works well because the middle ledge is broken, so you need more time to grab all the eggs on it. Two players working together should be able to collect all of the eggs before any bird has a chance to glide in and pick up a rider. The dreadful pterodactyl is not as invincible as the manufacturers would have you believe. In fact, it is simple to kill the winged reptile as it enters the playfield at the beginning of the pterodactyl wave (8th wave and every 5th wave thereafter). The trick is to land on the center platform in the middle of the screen and come to a complete halt. When the pterodactyl rears its ugly head, quickly push the joystick so that you are facing the creature. The pterodactyl flies up to your position and then thrusts forward--right into your lance! The beauty of this trick is that you can also use it on other waves when the last enemy rider is helplessly caught in the clutches of the lava troll. Simply wait on the center platform for the pterodactyl to appear and when it does, turn toward it and watch it run blindly into your weapon. As long as the last rider can't break free from the lavatroll, the pterodactyls keep coming--faster and faster. If you wait long enough, after killing about nine pterodactyls, the creatures appear very rapidly, so it is best that you destroy the enemy rider to complete the wave before you find yourself greatly outnumbered by raging pterodactyls. If for some reason you can't stab the pterodactyl, the best thing to do is avoid it. When this annoying creature appears, fly up or down to a different level. It will make a swooping pass and then try to move to the level that you are on. Once it positions itself, change your altitude with respect to the bottom of the screen. The quicker you complete the wave, the sooner the pterodactyl will disappear. As you progress through the different waves in Joust, certain ledges dissolve. While this clears the screen of some unwanted obstacles, it also makes for unrestricted warfare. At the beginning of every 5th wave, the board is returned to its original configuration, and the deterioration process begins anew. Additional mounts are awarded at operator-selectable point intervals. Losing a mount resets eggs to base value. Point values listed are the most common settings.